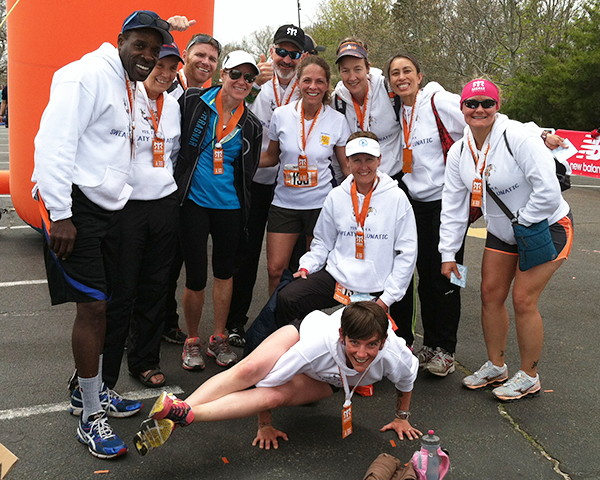 The Ragnar Cape Cod Relay team! LITSers include James Alston (far left), Felicia Bianchi (next to James), and Kevin Kirwin (center in black hat and sunglasses). The pose below is the Astavikrasana or crooked sage pose. Try it yourself! What does a project manager do on vacation? 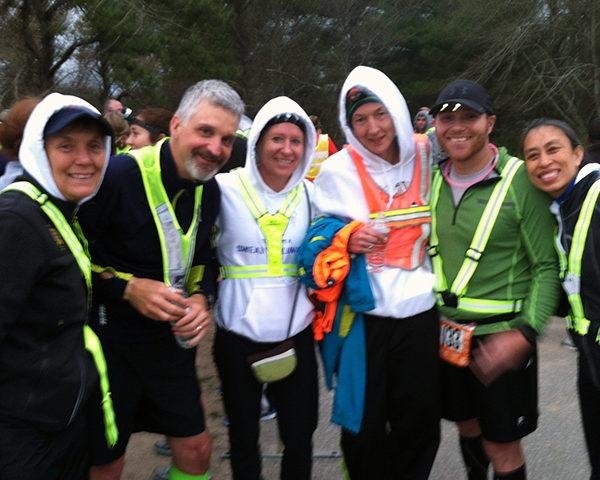 Well she manages a project to have a team complete the Ragnar Cape Cod Relay! One of my favorite things is to run crazy all-night relays. I have participated in over ten of them. I love it because it requires less training than for a marathon and when you have new people on the team you get to watch them dig deep and have fun. I got to do some of my favorite things – logistics and preparation – to get 12 of us ready to start at 9 a.m. May 9th in Hull, MA and spend the next 28 hours running the 190 miles to Provincetown (the tip of Cape Cod). Last minute changes – one runner dropped out and they added a mile of unsupported running to the last runner – had me kicking in my risk mitigation strategies, but we did start on time! Fellow LITS staffers, James Alston and Kevin Kirwan, were on our “Sweaty Lunatics” team. We had 2 vans and we leapfrogged each other, meeting every 6 legs for a reunion and transition. Most of the runners had the standard 3 runs with the hope of a 45-minute sleep in between. Three team members had to step up and do 4 legs but they were awesome and it all worked out. Relay members during a nighttime transition. We survived team members falling asleep in the port-a-potties, vans getting lost, running by graveyards with signs for a haunted tour at 2 a.m., and the threat of rain. James had a killer 9.4 mile final run, going right near Christopher Spaulding’s home town. My first run went by Plymouth Rock and the Mayflower. Kevin got to run by the marshes in Eastham in the early morning. We had an awesome team and everyone said that they would do it again. No, I did not slip something into their water bottles! Hey if you are a runner – we want you for the next one – just let us know! This entry was posted in Staff Bytes and tagged fitness, PMO, wellness. Bookmark the permalink. Post a comment or leave a trackback: Trackback URL.